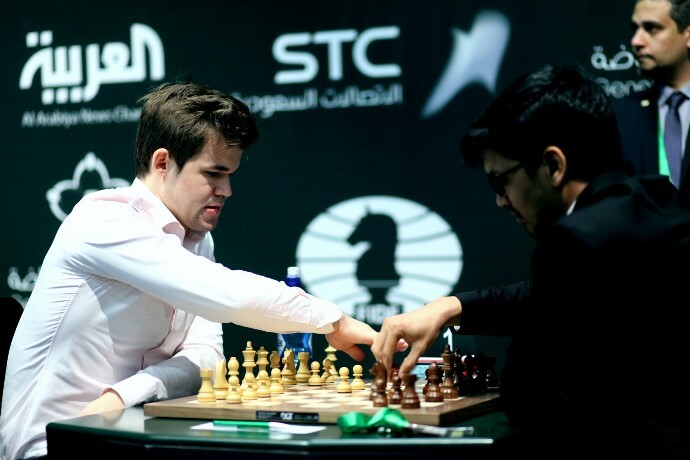 Magnus Carlsen has won his third World Blitz Championship and pocketed the $250,000 first prize after a stunning final day performance in Riyadh. Despite starting two points adrift he’d taken the lead within four rounds and with 8.5/9 managed to open up a two-point lead of his own before the final round. A last-round win gave Sergey Karjakin silver, while Vishy Anand took bronze and was the only man to feature on both the rapid and blitz podiums. Ju Wenjun pulled off that feat in the women’s section, but it was Nana Dzagnidze who took gold ahead of Valentina Gunina. 2017 was a year in which Magnus Carlsen failed to live up to his own stellar standards in classical chess, but nothing is wrong with his fast game. He won the Grand Chess Tour on the back of his rapid and blitz performances in Paris and Leuven, blew away Ding Liren in the Champions Showdown in St. Louis and can feel somewhat disappointed that his loss in the last round of the World Rapid Championship meant he “only” takes home a combined $282,833.33 from Riyadh (note all figures quoted in this article are before FIDE takes their 20% fee). 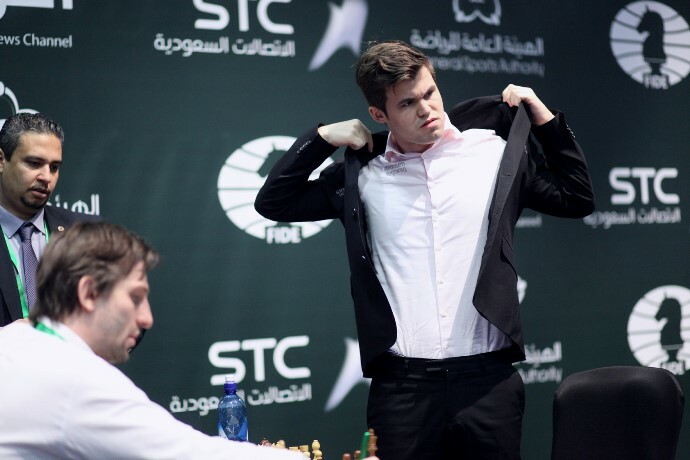 His blitz victory had looked anything but a foregone conclusion when he went into the final day in 20th place, two points behind leader Sergey Karjakin, but suddenly everything clicked. In the first game of the day he exorcised the demons of his painful loss to Alexander Grischuk in rapid chess by outplaying the Russian to open with a win. Then two games followed the same script, with first Harikrishna and then Shakhriyar Mamedyarov eventually blundering under pressure in games that seemed destined to end in draws. 39.Rd5+! picked up a piece. Mamedyarov paid the price for not exchanging his queen at multiple opportunities since he then blundered it with 38.Qd5? 38…Re1+! was the simple winning trick. For the first time in 13 rounds Magnus had fought his way back to the top board (and not just board no. 1 for the purposes of Norwegian TV), where he had the white pieces against Sergey Karjakin. 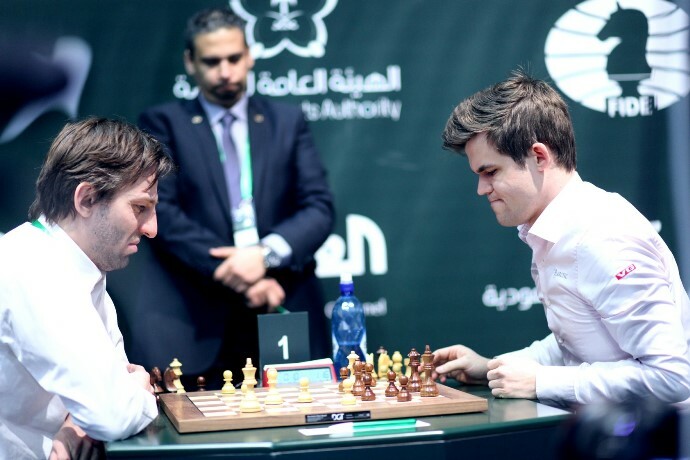 The Russian had started with three draws that saw his lead cut to half a point, and that momentum continued as Carlsen scored a brutal win – surprising his opponent in the opening and then launching a ferocious attack. The 19-year-old Russian had thought for a minute before his previous move but here spent only a second on 21…Rxa1, while 21…Rxb2!! 22.Qxb2 Rxc5! would have left him close to victory. Instead Magnus won that game and then sealed the title by outplaying Anton Korobov in a drawish position in the penultimate round. He was helped by fellow comeback kid Levon Aronian, who ended the first day in 68th place but stormed back with 8.5/10 in the second. 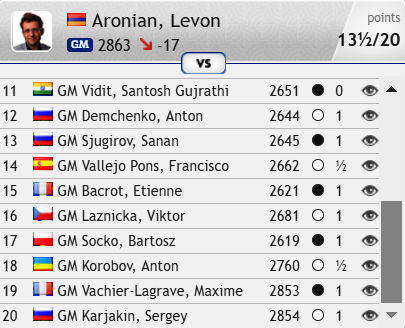 Levon followed a win over MVL in Round 19 by beating Karjakin in the penultimate round to confirm Magnus as Champion. He decided that was enough heroics for one day, though, and took a 12-move draw against Magnus in the final round. I’m obviously extremely happy. Yesterday was a very difficult day for me but today everything went beyond expectations. Although Magnus had wrapped things up before the final round it was absolutely all to play for when it came to the other podium places, with four players on 13.5 and a further six on 13 points. One of the 13.5 players, Wang Hao, was completely winning for most of his game against his compatriot Yu Yangyi. 46…Bc8! and it would just be a simple mopping up operation for Black. Instead after 46…Qe4? 47.Rd8 Rb1 48.Qc3! White had enough threats of his own to persuade Wang Hao, already very low on time, to force a draw by perpetual check. 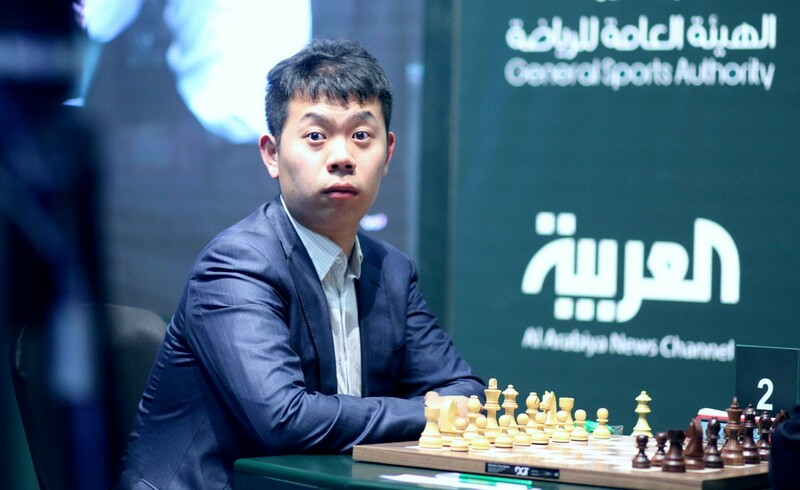 The silver lining for Wang Hao is that the draw saw him finish in 4-5th place with Levon Aronian, with the two sharing a healthy $45,000 each. 28.Qh6+! Kg8 29.Re4!! is winning, since 29…Nxe4 allows mate-in-4 after 30.Bh7+, though simply retreating the rook to e2 or e1 also leaves White in control. Instead things fell apart fast with 28.Be6? Re8 29.Qh6+ Ke7 30.Bc4?? and 30…Qxe5 was just a free rook. 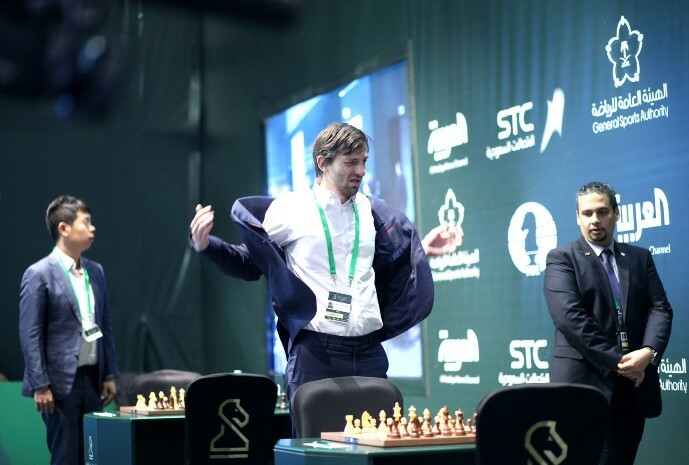 That win meant that although Sergey Karjakin had failed to defend his World Blitz title he took silver and $100,000, while Grischuk tied for 12th place and took home $7,214.29. Bronze went to Vishy Anand, who recovered from any World Rapid Championship hangover to score 6/7 in the final rounds. Again it came down to a blunder, when in a position that was drawish, and if anything better for White, Maxime Vachier-Lagrave decided to press for more with 50.Ke3?? In fact it was one loss in 38 games, as there were also the two playoff games vs. Fedoseev! …but after that she couldn’t maintain the same level and ultimately the 54-year-old Swedish star lost her last three games to drop back to 5th place and earn $10,000 – a case of what might have been, but still not bad for the 53rd seed! 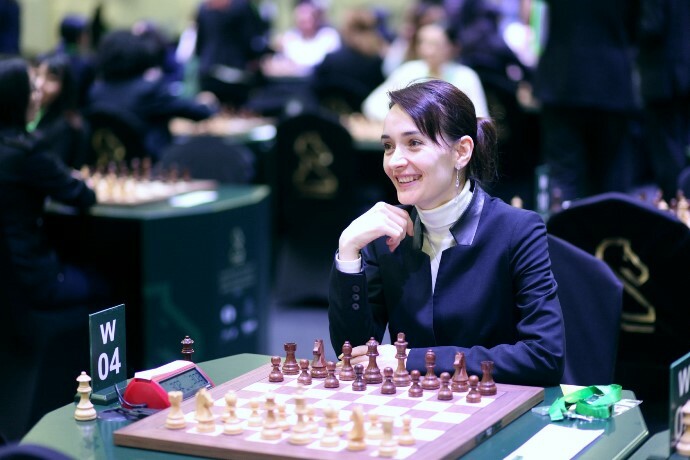 Valentina Gunina took silver and $40,000 after winning her final five games, while 3-4th place and $20,500 was shared by Kateryna Lagno and Ju Wenjun, with Ju Wenjun taking the bronze medal by convincingly defeating Lagno with Black in the final round. 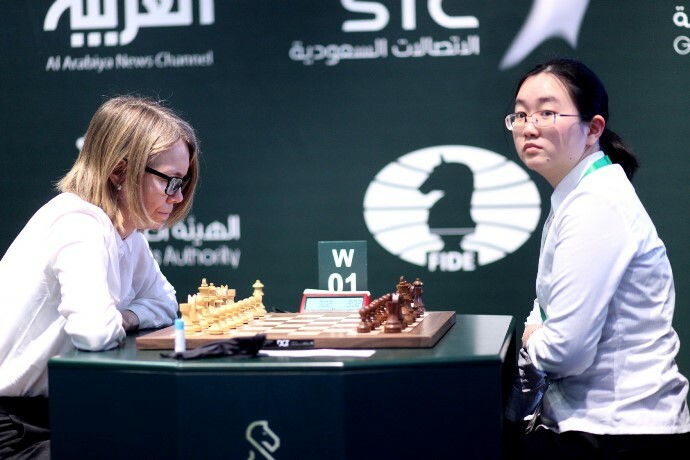 She’d pulled off the Vishy Anand trick of picking up gold and bronze medals, and was the highest earning woman with $100,500. So that’s about all for 2017 in chess (a 4-game Wei Yi vs. David Navara match has just started in China). We hope you’ve enjoyed all the coverage here at chess24 and will make going Premium your New Year’s Resolution for 2018 If you are Premium you can check out Jan Gustafsson’s new video series on AlphaZero and what it tells us about how to play the Queen’s Indian! The bonus final video there is a 37-minute chat with Super-GM Peter Svidler on Google/DeepMind’s monster.